Michigan plays at Penn State this evening (7 p.m., BTN) in search of its first road win of the season. The Wolverines will be matched up against one of the conference’s top guards in DJ Newbill and a Penn State team searching for its first Big Ten win of the season. Michigan’s last two trips to State College have been memorable for very different reasons. Three years ago, the Wolverines beat Penn State and managed to back into a share of their first Big Ten title in decades. A year later, Michigan suffered an embarrassing loss to a Penn State team that entered the game 0-14 in Big Ten play – that close to rock bottom for a slumping Wolverine team – but then somehow bounced back and made a run to the Final Four. This game won’t pack nearly the same sort of drama, but will be a battle of two teams that desperately need a win to right the ship in early January. Not much about Penn State’s statistical profile jumps off the page. The Nittany Lions are ranked 114th in adjusted offensive efficiency and 80th in adjusted defensive efficiency – numbers that are very similar to Michigan’s 128th off. and 75th def. rankings — and are only ranked in the top-100 in one four factors measure on either side of the ball (43.8 defensive eFG%, 39th). Offensively, Penn State is average at just about everything. The Nittany Lions are better shooting the ball inside the arc (49.8%) than outside (31.9%) and attempt around 36% of their field goals from outside the arc. PSU isn’t a great offensive rebounding team, but it does get to the line fairly often — attempting 40 free throws per 100 field goal attempts. Over a quarter of Penn State’s offensive possessions are ball screens and they score .91 points per ball screen (including passes). Another 13% are isolation sets, where again the Nittany Lions grade out favorably. This is a team that, much like Michigan, relies on DJ Newbill to breakdown the defense and try to create something for himself or his teammates. Defensively, Penn State’s field goal defense is impressive. Nittany Lion opponents are shooting just 42.8% on twos (42nd) and 30.6% on threes (71st) this season and only three teams (Charlotte, Bucknell and Wisconsin) have managed an eG% above 50%. 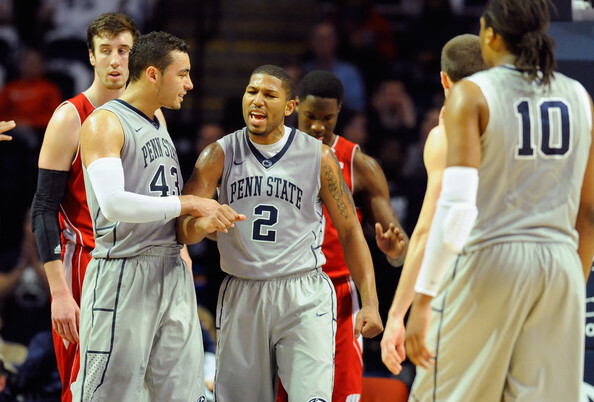 Fouling has been Penn State’s Achilles’ heel. PSU is ranked 237th in free throw rate allowed and in all three of its losses, it has surrendered a free throw rate over 50% four times — including its three losses. DJ Newbill is one of the best one-on-one players in the conference and his career at Penn State has been impressive to watch. He was immediately thrown into a tough situation during his first year at Penn State as Tim Frazier suffered a season-ending injury, but has improved his efficiency in each season since that year. This year, Newbill is shooting 49% on twos, 39% on threes, and attempting 46 free throws per 100 field goal attempts. His offensive rating of 114 is impressive for a player using 29% of available possessions and 92% of available minutes. Freshman guard Shep Garner has shown promise, averaging 9.7 points and 2.2 assists per game. Garner is Penn State’s secondary ball screen and isolation option and he’s shooting an impressive 55% on twos and 36% on threes. 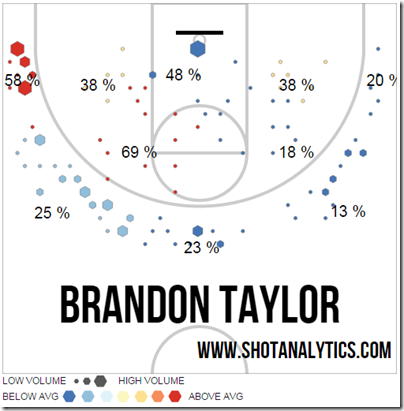 6-foot-6 wing Brandon Taylor attempts over half of his shots from three-point range, but connects at just a 29% clip. 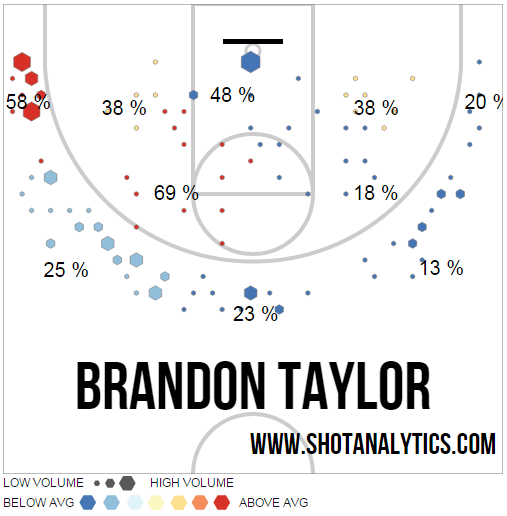 Taylor is a below-average shooter at every spot around the three-point line other than the left corner, where he shoots 58%. Ross Travis plays stretch four minutes for the Nittany Lions and is the best offensive and defensive rebounder on the roster. Travis isn’t the most efficient or highest usage player on Penn State’s roster, but he still should provide a physical challenge for Kameron Chatman and Zak Irvin. Geno Thorpe is at his best in transition and boasts a free throw rate of 74 FTA per 100 FGAs. The 6-foot-3 sophomore is still turnover prone and shoots just 48% on twos and 26% on threes. Like Thorpe, John Johnson is getting to the free throw line often, but doesn’t have great shooting numbers. The 6-foot-1 guard who played his freshman year at Pitt is shooting 49% on twos and 33% on threes. Keep DJ Newbill out of the lane: Newbill will give Michigan’s guards all they can handle defensively, but the bigger concern might be whether Michigan’s big men can hedge and recover effectively against a mature ball screen player. Two years ago when Michigan lost at Penn State, ball screen defense was the culprit and that was with a much more experienced stable of big men. Get to the free throw line: We’ve established that Michigan is struggling to score at the basket (36.9% on twos in Big Ten games), but it also struggles to get to the free throw line consistently. Penn State’s propensity to foul could help jumpstart a Michigan offense that has needed all of the help it can get in recent games. This is a chance for Michigan to escape with a 1-1 record on the road and setup a key home game against Minnesota. The Nittany Lions also need a win and enter the game as three-point favorites according to Ken Pomeroy, who gives Michigan just a 34% chance of the upset.